Pancake day – a day to use up the fatty food, eggs, milk and sugar before lent. Religion aside, the day is a day of fun for many with pancake tossing races taking place throughout the country. This year, I decided to ring the changes and make savoury pancakes although I’ve no doubt that the sweeter version will feature at some point during the day. Dulse and herb crepes with potted smoked salmon. 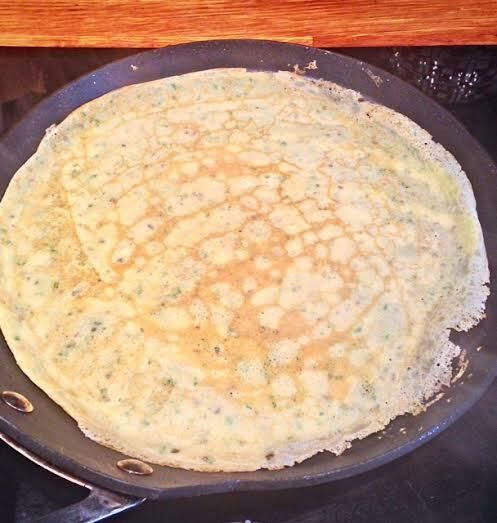 These savoury crepes are incredibly easy to make and will make an ideal lunch. The potted salmon can be made ahead using either smoked salmon or the more robust hot smoked salmon. 2 large eggs. handful of parsley (as an lternative use a mix of herbs such as chives, dill, chervill). 110g plain flour. 1tbsp Mara Seaweed Dulse flakes. 275ml milk. 2 tbsp melted butter. Freshly ground black pepper. Method. I used a food processor although the ingredients can easily be mixed together with a food mixer. Add the eggs and parsley to the food processor and whizz to mix and chop the parsley. Gradually add the remaining ingredients and process to ensure all the ingredients are mixed. Heat a small amount of butter in a crepe pan, then pour in about 3-4 tbsp of the batter, swirling the mixture around to ensure the base of the pan is covered. Cook for about 30 secs and then flip over and cook for a further 30 secs. Repeat until all the batter has been used. Stack using baking parchment between each crepe to prevent sticking together and cover with a tea towel to keep warm. Method. Melt the butter in a small pan and set aside to cool. Add the hot smoked salmon, smoked salmon, creme fraiche, lemon juice, dill, 1 tbsp of the melted butter & seasoning to a food processor. Process on pulse mode until mixed but not completely smooth. Spoon into a serving dish and refrigerate until ready to use. To serve. Fold each crepe in half and top one quarter with spinach leaves. Add a generous spoonful of the potted salmon and some chopped spring onion and fold to a quarter. Serve sprinkled with extra seaweed flakes and spring onions. 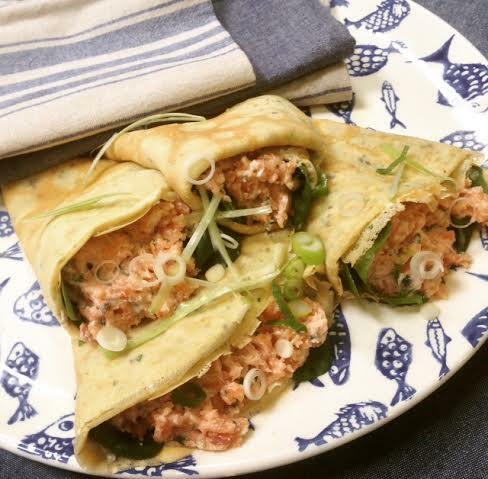 Thank you to Loch Fyne for supplying the Bradan Orach smoked salmon used in this recipe. Further information on Scottish Salmon can be found on the Scottish Salmon Producers Website. Great for using in a Boxing Day frittata. A box of 6 eggs, some leftover pigs in blankets and pork stuffing are great for adding great flavour. A perfect brunch dish that all the family will love. Frittata is a great way to use up some Christmas leftovers. Easy to make and vary the flavours with whatever's in the fridge. 50 ml cream double or single cream or replace with milk. handful chopped herbs parsley & thyme work well or use a tsp of dried herbs. Pre heat the oven to 190C/170C fan Gas 5 Grease a small rectangle baking tin. Whisk the eggs and the cream together. Add the chopped herbs and season with salt and pepper. 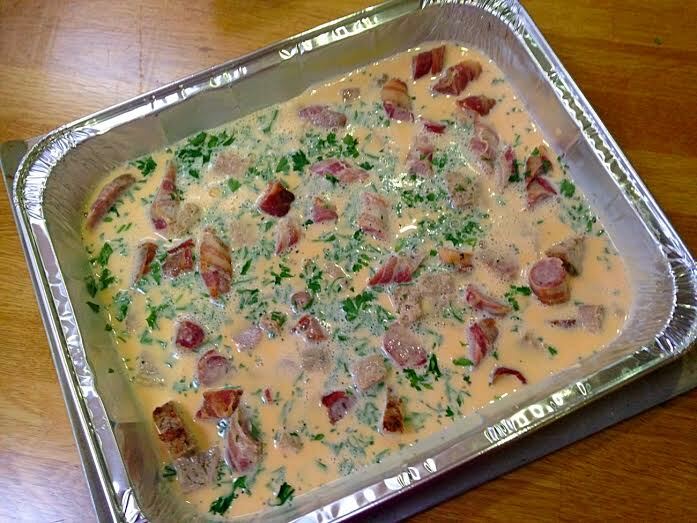 Add the leftover meat to the baking tin and pour over the eggs. Bake for 30-35 until cooked through. The frittata will be firm to touch and slightly puffed up. Vary the flavours to suit whatever leftovers are in the fridge. Tomatoes, cranberries, or salad leftovers such as spinach and rocket will all work well. Most of my leftover vegetables end up in soup but summer veg such as courgettes, peppers, tomatoes and the odd few roast potatoes usually end up in a frittata. It’s such a waste not to use them up and with the added eggs it makes an economical and healthy meal. 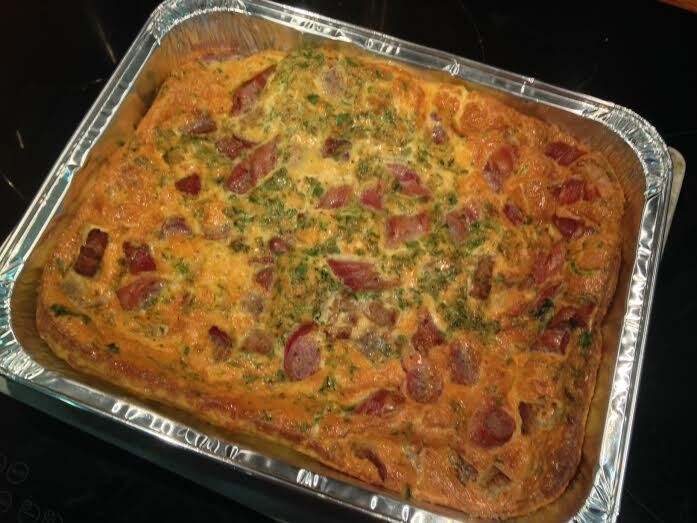 Frittata is such an easy dish to make and can be served hot or cold for a meal or as part of a packed lunch. A few uncooked tomatoes, a few olives and mozzarella balls also made it into the frittata, all helping to pack in some extra flavour. 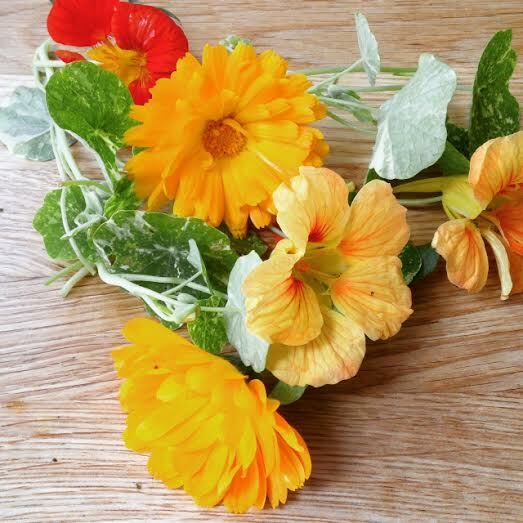 Some edible flowers and herbs were also added as I’ve been growing lots of herbs in my own garden and I’ve successfully grown quite a few edible flower plants this year. 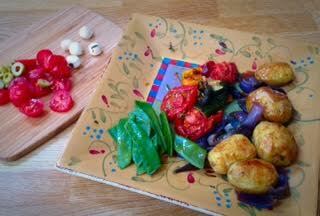 The leftover vegetables had originally been cooked in olive oil and flavoured with lemon thyme, rosemary and basil. 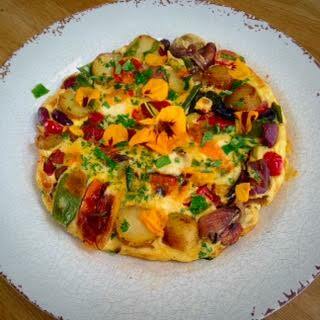 The flowers add a nice peppery kick and also give a bright summer feel to the frittata. The recipe can be easily varied with different herbs or vegetable and will also work if cooked on the hob. 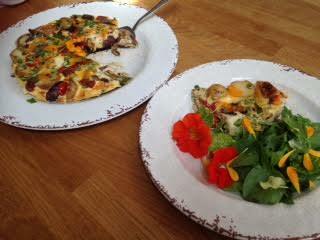 Frittata is a great way to use up leftover vegetables and makes a healthy meal or have as a part of a packed lunch. approxiametely 250g leftover vegetables - onion, tomatoes, pepper, mangetout - or whatever veg you have. leftover Mozzarella balls Any cheese will work, particularly Parmesan or cheddar. Pre Heat the oven to 190C/170fan Gas 5. Heat the oil in a 10" oven proof pan and saute the uncooked tomatoes and sliced potatoes for 1 minute. Add the remainder of the cooked vegetables and allow to heat through. Meanwhile, whisk the eggs and creme fraiche together in a large bowl. seaon with salt and freshly ground black pepper. 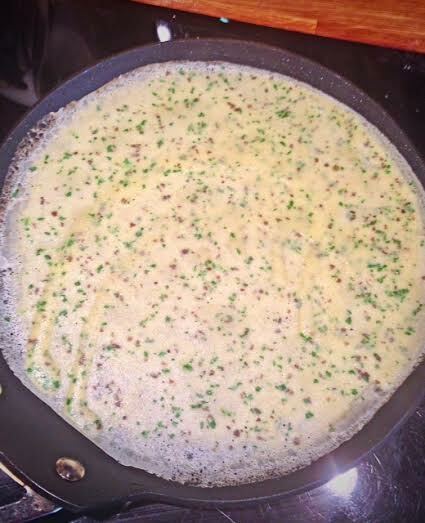 Make sure the sides of the pan are coated with the oil and add the egg mixture to the pan. Cook for approximately 5 minutes and then add the mozzarella, olives, and scatter over the calendula petals and nasturtium leaves. Transfer to the oven and bake for approximately 30-35 minutes until the frittata is firm to touch and slightly puffed up. To serve - Top with nasturtium flowers and chopped nasturtium leaves and serve with a salad of salad and nasturtium leaves.